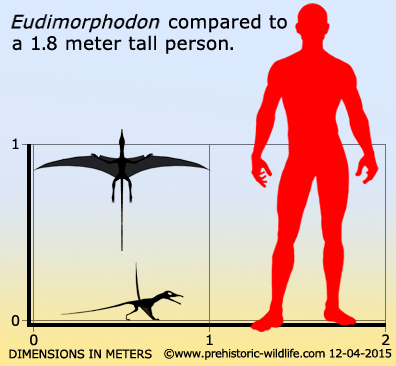 Name: Eudimorphodon (True dimorphic tooth). Named By: Zambelli - 1973. 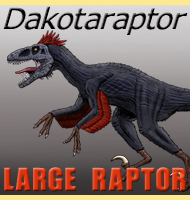 Classification: Chordata, Reptilia, Pterosauria, Campylognathoididae. Species: E. ranzii (type), E. cromptonellus. Known locations: Greenland. Across Western Europe. Eudimorphodon represents one of the earliest known pterosaurs, and already features that include a possibly vaned tail like that seen in Rhamphorhynchus can be clearly seen to be established. However the tail seems to lack stiffening tendons that can be seen in the rhamphorhynchoid group, and may have been of little use in steering as some researchers have speculated for the basal pterosaurs. 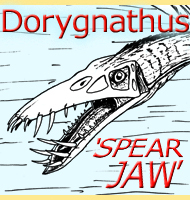 Eudimorphodon also has pterygoid teeth, something not seen in later pterosaurs. 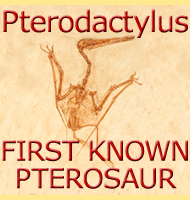 Despite these primitive features, the exact position of Eudimorphodon in the evolution of pterosaurs is still unknown because no clear changing link to their ancestors, thought to have been gliding arboreal lizards, has been established. One thing that may actually be considered is the possibility of what is known as 'modular evolution' as seen in the transitional pterosaur Darwinopterus. 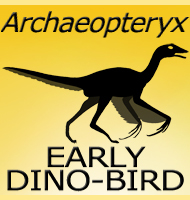 While Darwinopterus links the later rhamphorhynchoid group with the pterodactyloid group of pterosaurs, it has shown that this change was not gradual over the whole body, but that only one body part would change at a time. 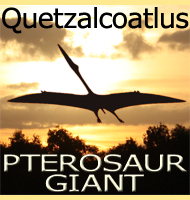 This resulted in Darwinopterus displaying both primitive and advanced pterosaur body parts, with no intermediate forms in between. If modular evolution is true for Eudimorphodon, then it would go some way in explaining the more primitive tail, as well as the presence of pterygoid teeth. 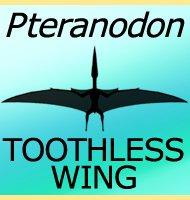 Eudimorphodon is one of the few pterosaurs where we can be absolutely certain about its diet, due to the presence of the remains of small bony fish that have been found inside at least one specimen. 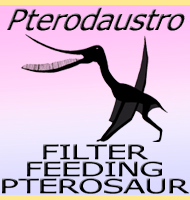 Even though some pterosaurs would go on to different feeding strategies such as stalking the land like storks or filter feeding for invertebrates, the relationship between pterosaurs and fish as predator and prey would continue all the way to the end of the Mesozoic. A former species of Eudimorphodon from greenland, E. cromptonellus, has now been renamed as a distinct genus, Arcticodactylus. - Eudimorphodon ranzii gen. nov., sp. nov., uno pterosauro Triassico. - Rendiconti Scienze di Instituto Lombardo, B 107:27-32. - R. Zambelli - 1973. - A diminutive pterosaur (Pterosauria: Eudimorphodontidae) from the Greenlandic Triassic. - Bulletin Museum of Comparative Zoology 156(1):151-170. - F. A. Jenkins, N. H. Shubin, S. M. Gatesy & K. Padian - 2001.